Review pathophysiology of atopic dermatitis. Participants should be able to recognize the common and not so common presentations of the acute abdomen. Participants will learn the approach to avoid the missing the most life threatening abdominal emergencies. Participants will learn the common overdoses, toxidromes, and the approach in working up an unknown overdose. Participants will learn basic antidotes to common overdoses. Participants should be able to recognize minor vs major dental emergencies, know when to refer, and what treatment are being rendered to their patients. Overview of Osteonecrosis of the jaws, a potential of wide us of bisphosphonates in primary care. Participants should be able to recognize certain medication that affect oral health . How to discontinue and continue anti-coaggulants for dental procedures . Services: cosmetic, implants, orthodontic treatments, gum surgeries, laser. Designation: Continuing Education, Inc. designates this live activity for a maximum of 12 AMA PRA Category 1 Credits™ . Each physician should claim only the credit commensurate with the extent of their participation in the activity. Grand Turk - Grand Turk is a picturesque island with a relaxed pace and a warm, friendly atmosphere. There are no fast food chains and no sprawling resorts.In addition to the amazing year around diving, with Oasis Divers you have seasonal attractions such as the North Atlantic humpback whales during the winter and manta rays in the summer, you're sure to be amazed. 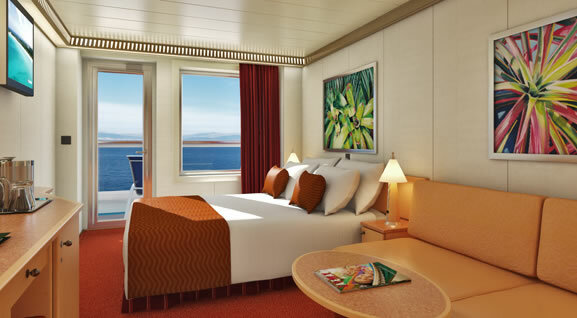 La Romana, Dominican Republic - Cruise to La Romana to play on some of the Caribbean's most beautiful beaches and lush terrain. La Romana, Dominican Republic, is a captivating slice of the tropics on the island's southeast coast. On your Carnival® Dominican Republic cruise, you can comb the cobblestoned streets of a re-created medieval village, hunt for craft treasures, and thrill to the pampered luxury of Casa de Campo, the 7,000-acre resort next door. Relax on the tropical hideaway of Saona Island. Wander the streets of a re-created 16th-century Spanish village. Take to the turquoise Caribbean Sea by snorkel, sail, or kayak. 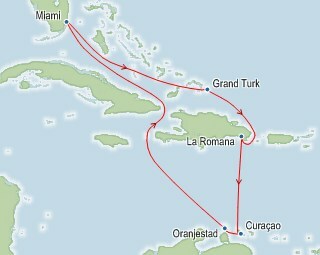 See cigars being rolled by hand with cruises to La Romana. Buy handmade pottery from the artists themselves at Altos de Chavon. 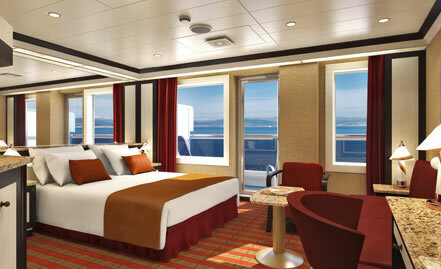 Ocean Suite (OS) A Carnival Splendor suite is the ultimate way to cruise. 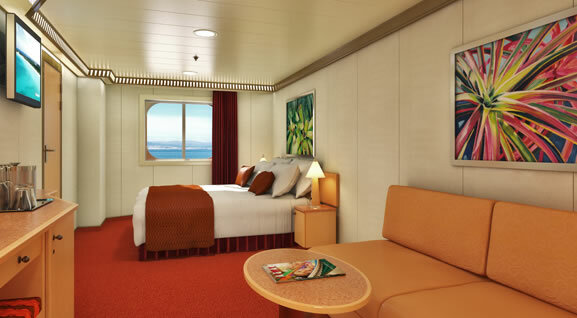 With more space for stretching out indoors, plus a large balcony for kicking back outdoors, try an Ocean Suite to experience private, luxurious relaxation. 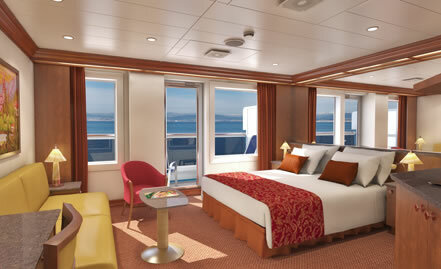 Ocean Suites also include VIP check-in, walk-in closet and bathroom with whirlpool. 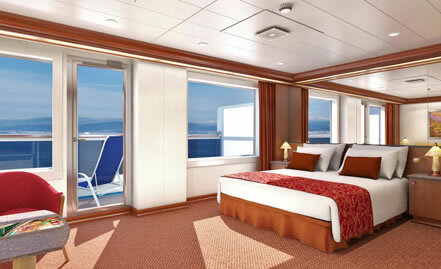 Inside (4B)- A comfortable stateroom retreat, where some rooms also feature pull-down beds  ideal for families. 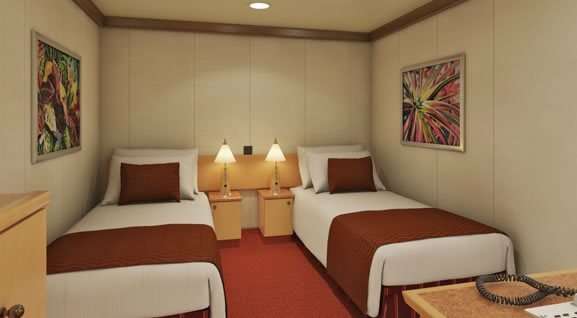 Stateroom amenities: Television Soft, comfortable, and cozy linens Hairdryer/Bathrobes 24-hour stateroom service Ample closet and drawer space .